We Are Located In the Styvesant Heights Section of Brooklyn. Metro/Subway Is Located Within a 3 Minute Walk. Exciting new arena the BARCLAY CENTER is located within a 10 minute walk We Are 20 Minutes From Manhattan and 10 Minutes From Downtown Brooklyn. This Property has a Private Huge Garden Area with Bbq Grill, and Entertainment Area All Enclosed For Your Privacy. It Also has a Sitting Area In the Front of the Building So That You Can Get a Feel For the People and Culture of the Neighborhood. We Are Surrounded My Other Diverse Neighborhoods Such As Williamsburg, Clinton Hill, Dumbo, and Forte Greene Which has a Lovely Park For Jogging, Biking, Tennis, Dog Walk, Farmers Market On Saturday. There Is Also a Reasonably Priced Fitness Center (Ymca) For Your Morning Exercise. Diverse Neighborhood: We have found that the attraction to most tourist is this neighborhoods diverse dining and social bars. If you find you need any further accommodation just let us know and we will do our best to get it. First time to NY. This was the perfect location. Close to the subway, stores, groceries. Lydia was so helpful. I'd definitely recommend staying here and would love to come back someday. The place was as described and my wife and I, with our little girl felt at home during the week we stayed at Lidia's. She is very nice and responsive. Would come back in the future. Had an amazing stay. The property was very close to the subway. We be staying again! Lídia is Very amazing. She showed us everything near by the house. And we could buy food and take the subway with no troubles. We arrived before the time and she was There to recive us. It was all Very good. She is really a Very good hostess. I'd back There. Thanks Lídia for all your helpness. I feel better There than in my city in Brasil to walk on the streets, any time of the day. I arrived sometimes Very late, at night, by Subway and the streets was Very Nice to walk. Really Very calm. I'd like It Very much. There are many orthodox Jew too. We booked this 'private, sunny garden apartment' mainly for the garden and were very disappointed. It is not well maintained and not enjoyable to sit outside in - for example a large shopping trolley filled with plastic was just hanging out in the middle. It doesn't feel 'private' either as the host and her family live upstairs and their windows overlook the garden. Whilst this second point is not a criticism we feel the advert stating privacy miss sells the property. We left the property midweek because there were mice in the kitchen that left evidence of mice poo and ate our food. We immediately asked the host for a refund for the rest of the week so we could find a hotel without mice and she obliged. She also responded quickly when I emailed her to ask for a replacement hairdryer as the one in the apartment was broken. The area was good for the price of the apartment. There are entertainment and bars a walk away and it is close to several metro stations to explore the rest of NYC. 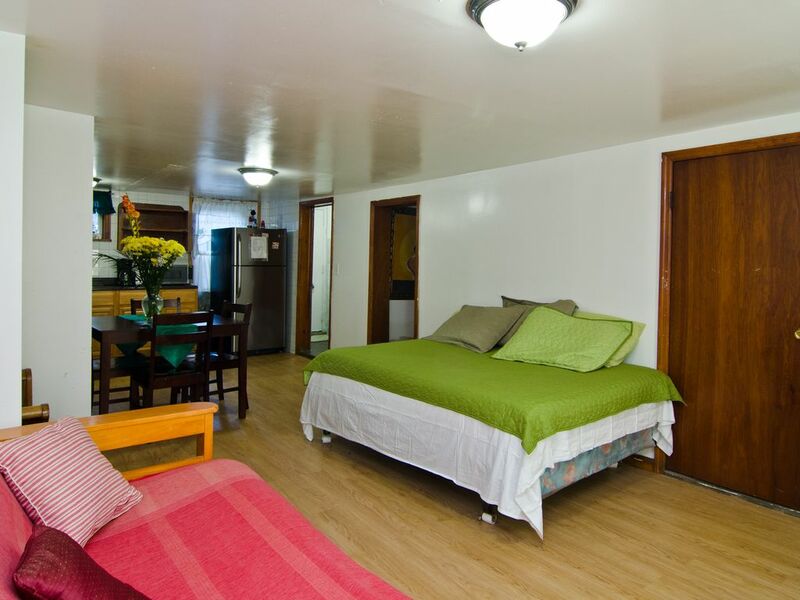 Our Rates Are Not Per Person and All Taxes Are Included. We Do Not Charge Any Additional Taxes.